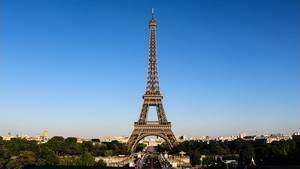 From the design of the Eiffel Tower the problem of the routing of men on the floors was posed. How to climb so high without getting tired on foot? The solution had been invented a short time ago, it was enough to install these new devices, "Elevators". The tower having 4 pillars, it was logical to install one in each pillar. They went up to the first floor, then went on their way to the second, before going down again. Over the years they have evolved, been moved, deleted, improved, but they still exist. Nowadays there are 6 lifts. 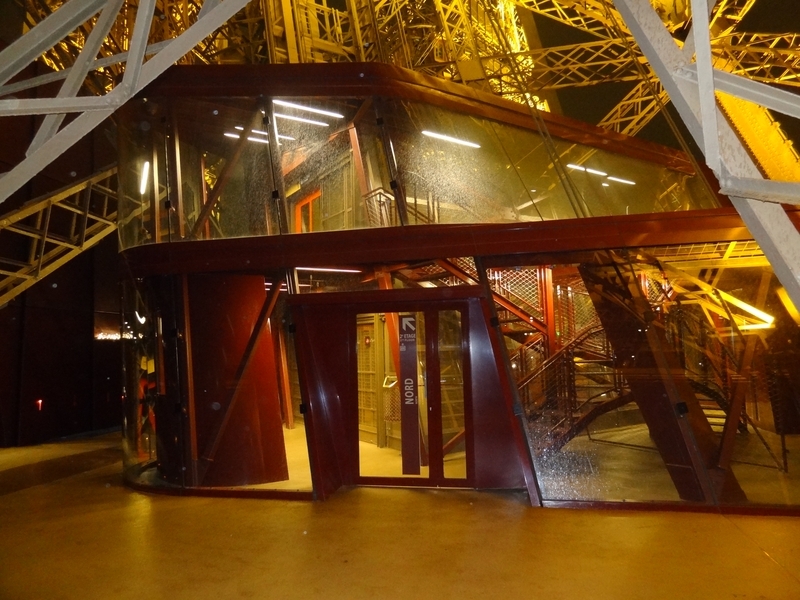 Three go up to the 2nd floor (Pillar East, North and West), two go up from the 2nd to the 3rd floor and the last, in the south pillar, is privative: It allows to go directly to the restaurant "Jules Verne", which is at 1st floor, it is reserved for the customers of the restaurant. Also note the presence of a lift in the South pillar. As a tourist, wanting to use one of these lifts must mentally prepare you for a long wait: In high season, there are sometimes 3 hours of tail! If you are motivated you can climb on foot: The staircase is located in the South pillar, it rises slowly, landing in stages, and offers a view much more beautiful and varied than that which one has elevators. One of the highlights of the climb on foot and the arrival under the first floor, the tower becomes imposing, a feeling of heaviness compensated by the height at which one finds oneself. 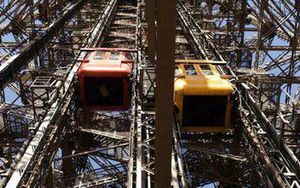 Of course it's tempting: Rather than climb the 720 steps to the second floor of the Eiffel Tower, why not take the elevator, which takes us there in seconds? You must know that the elevator is above all difficult because of the tail that can be. At peak times, it's not uncommon to have 2 hours of tail before getting into the cabin, and again, I'm nice, it can be more. No need to get upset, the wait is due to the very nature of the tower, which can not rise at the same time as a limited number of people. But if you have time, or if you are on a low-income day, do not hesitate, you will save energy to visit. In addition you can go, if you want, to the top, which we can not do on foot. A disadvantage, however, to climb in an elevator: We benefit less from the sight and the feeling of height, which appears little by little. It is interesting to feel, except for those who are paralyzed at the sight of emptiness, in this case, prefer the elevator. Another tip: There are several pillars that allow you to climb in an elevator, so before putting yourself in a queue, look closely at the shorter line. It is not uncommon to gain up to 3/4 of an hour just by choosing the correct pillar you want. Once in the queue know that you will be systematically controlled. The bags are open, the metal objects go through a security gantry, and you have. We do not laugh with security at the Eiffel Tower. Finally in the pillar, do not believe that you have arrived. You have to wait for the cabin, which takes a while to arrive and leave. In addition the rise of the ground floor goes up to the 2nd floor, with a stop at the 1st during which the doors remain closed, you can not go down directly to the 1st, it is obligatory to pass by the 2nd floor and to go back down to the 1st . It sounds stupid, but I think it is to streamline the flow of tourists because otherwise everyone would go down to the 1st and would like to go up to the 2nd, then the 3rd, which limits the flow Ground-3rd, followed by a step down on each floor, which must be easier for the staff to handle. The lifts are double-cabins, they are yellow or red, depending on the pillar. The cabins are superimposed and the stations are equipped with a mezzanine to divide the travelers into 2 groups, ready to climb. If there is no affluence, the upper cabin is not used. Learn more about Using the tourist elevators. On the other hand the stations of the 1st floor underwent various modifications, at the moment they are very modern, all in glass, with very little metal, they are of rounded form. The few metal parts, like the roof, are the same color as the pavilions, a burgundy red reminiscent of the original color of the tower. There are two lift stations on the 1st floor. On the 2nd floor the lift stations are simpler, more technical, it is sort of "rabbit cages" very technical mesh. Having painted red or yellow training wheels makes them more cheerful. The stations allowing the rise to the 3rd floor are inside the central building of the 2nd floor, one sees only the 4 doors opening on the 4 cabins. And it's the same for the third floor, where visitors arrive directly in the main room. By the way, did you notice that the floor of the elevator is always perfectly horizontal when climbing? And yet the cabin follows rails that incline more and more, so it should lean more and more? This is simply because the nineteenth-century engineers had mounted a simple platform capable of tilting according to the slope, and it was on this platform that the cabin was fixed. The latter does not follow the rails, it is its support that follows. When you wait for the cabin, on the ground floor, or when you get off the elevator there, you will notice the 3 huge red and yellow tanks that go up and down depending on the position of the cabin. When it is on the second floor, the cisterns protrude from the ground of 3m whereas at their base stations, they have entered the ground. These tanks are counterweights, so they follow the movement of the elevator. 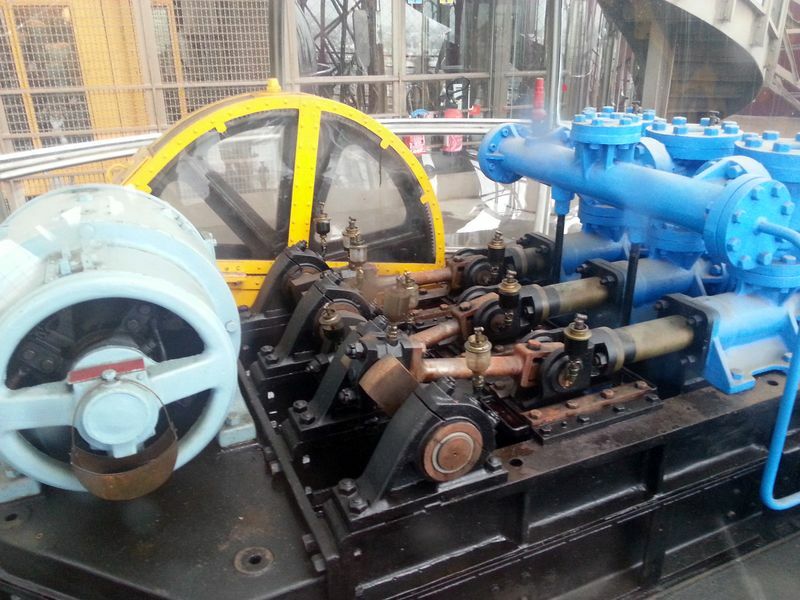 They are the water reserves that were originally used for hydraulic pumps to power the machines. Now retired, they only serve as counterweight, and one of them is also completely retired, unused. Here are some figures on the elevators of the Eiffel Tower, to get an idea of ​​their importance. The fact that the lift travels more than 12 meters higher than its altitude is explained by the fact that the rails are inclined, so the elevator goes diagonally. Nowadays lifts are all electric vehicles, but at the beginning it was the hydraulic force that made them work. Hydraulic motors pushed a piston which wound the cable around wheels, causing the tension of this cable and by ricochet effect the elevation of the cabin. The original machinery of the elevators is accessible to the public, it is in a room containing all these machines, piously preserved. Unfortunately you have to go for heritage days, or plan a guided tour. Other machines are more accessible: For example the hydraulic pump that supplied water to the machinery of the elevator Edoux, which rose to the 3rd floor, is exposed on the first floor. Hydraulic pump for feeding the Edoux lift, dismantled in 1983. 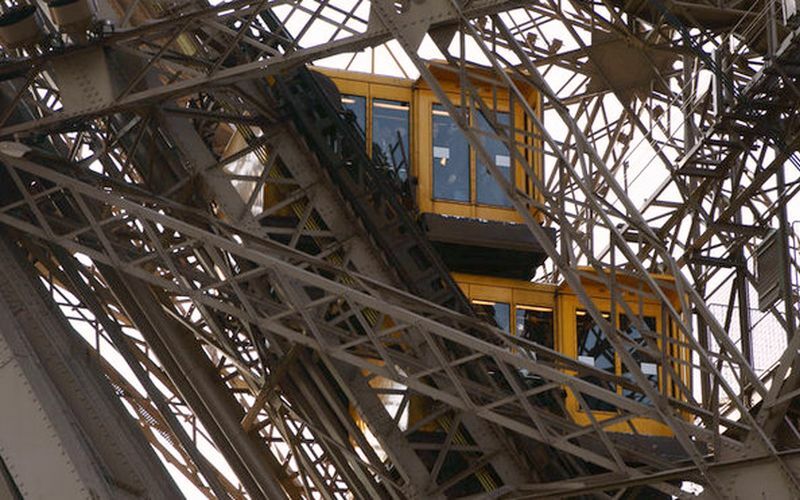 One of the problems with elevators on the Eiffel Tower is the sloping rail that is not constant. Actually, an elevator is vertical, it is towed up straight. Here, not only is the path not rectilinear but it is curved on the lower part and becomes vertical on the upper part. The inclination varies from 54 ° at the base to 80 ° at the 2nd floor. It was necessary to make systems tilting the cabin during the ascent / descent. Each elevator has 6 cables that can each support 2 times the maximum total load. From the point of view of safety, it's as if the engineers had planned them 12 times too resistant. Their sections is 28mm, they are arranged in 2 rows of 3 cables. 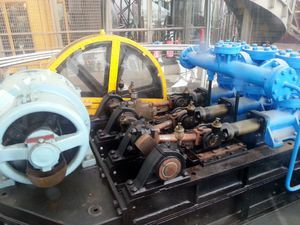 The pressure of the hydraulic circuits, at the time when the lifts were moved by hydaulic force, was between 40 and 60 bar, which was considerable. 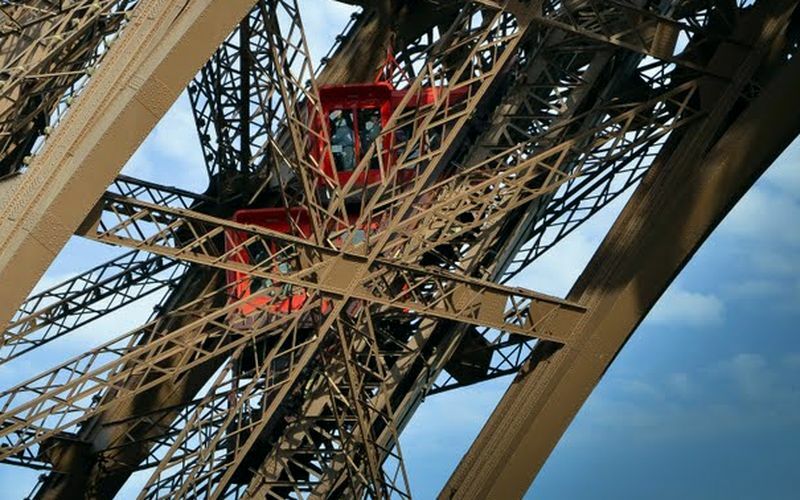 To find out the weight of the elevators and the technical installations that had to be added to the tower to make them work, go to the page giving the weight from the Eiffel Tower. 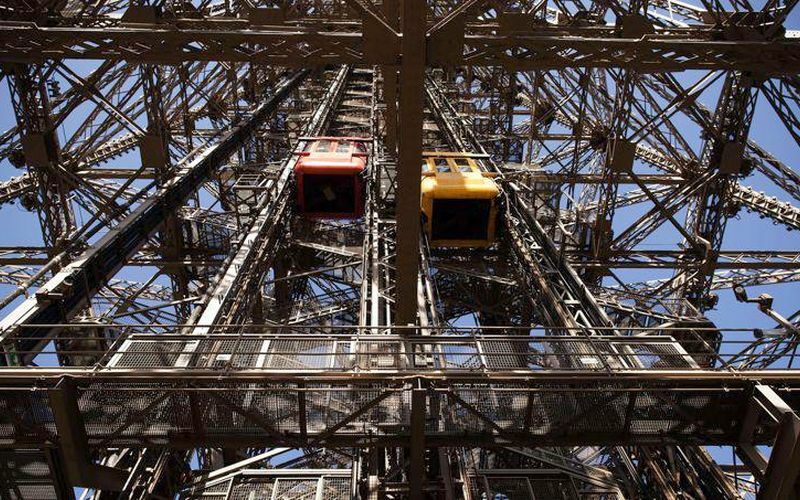 The plans of the Eiffel Tower provided for 5 lifts, one per pillar plus one that climbed to the 3rd floor. They were all built and installed, and as early as 1898 visitors could marvel at climbing so high so quickly. Do not forget that this equipment was terribly innovative for the time, few people had a lift for their daily. Those in the Eiffel Tower had one or two cabins, but they were not reliable enough to stay as long as they could. As early as the world exhibition of 1900 Gustave Eiffel had to renovate them because of the technologies used for these first models. Thus the two lifts "Roux-Combaluzier" installed in the pillars East and West were replaced in 1897, and the other two, in the other two pillars, were in 1910. From 1899 the East and West pillars received their replacements, machines "Fives-Lille" modern hydraulic, and have remained for a long time since the system was changed in 2008. The other two pillars were equipped with Otis , which were replaced by double cabins in 1983 (renovated in 1994, 1995 and 2007). In 1965 the tower received a new apparatus, a lift "Schneider", installed in the North pillar. It has been renovated several times already but it is still running. Finally, there was the problem of climbing to the 3rd floor of the tower. It was ensured by an elevator of the brand Edoux, a hydraulic cylinder system pushing the cabin on 80m. It remained in service until 1983, when it was dismantled due to obsolescence. Moreover being hydraulic, it could not work in winter because of the frost. It has been replaced by two sets of double cabins. During the construction of the tower the machinery was independent of the tower, it was with the tools of electricity production in the basement of the piles and mainly in the pile of the side Grenelle-Ecole Militaire. They consisted mainly of generators and pumps that pumped water into reservoirs on the different floors, with pipes starting from these tanks and bringing the water under the pistons to maneuver the lifts. See also: The history of the Eiffel Tower. The first floor, on which restaurants, breweries, etc., were installed, was to attract the greatest number of people; it was also served by two special lifts, each capable of raising 100 people each trip and making 12 trips per hour, so that in 10 hours a total of 12,000 people would go up. These elevators, installed in the West and East pillars, were of a new system, called articulated pistons, of MM. Roux, Combaluzier and Lepape. On the second floor, Otis, an American company, had to supply elevators installed in the North and South pillars. These lifts were able to transport everyone, from the ground to the second, with or without stopping at the first, 50 travelers and make about 10 trips with the total journey. As a stop at the first was necessary, at least for the descent, one of the lifts had to make the direct route by removing 5,000 travelers during the day and the other had to make the route from the first to the second floor by making 14 trips , that is, carrying 7,000 passengers. It was possible to bring to the second floor the same number of passengers as the first, or 12,000. For the central upper elevator, a Fractional Edoux Elevator with a change of cabin was chosen for the intermediate platform. The number of passengers on the hour had to be, assuming 63 passengers in the cabin, 750 per hour, or 7,500 for 10 hours. This program has been pretty much done, but, it is true, with the help of the stairs. Indeed, the average number of visitors was about 15,000 per day, of which 5,000 for the summit and 10,000 for the second platform, 5,000 stopping at the first platform. Only the efficiency of the Édoux lift has remained significantly below expectations. In general, there was much more visitor activity than the flow of the elevators, and each of them had tails that made it very long and laborious. ascent to the summit. So it was promised at that time, that, if we were to a new Exhibition, there was no hesitation to make modifications to existing facilities. The establishment of these elevators, all of which were hydraulic, was to result in the installation of steam engines and pumps bringing the water into the various tanks placed on the Tower and from which it had to go to different cylinders. The Otis and Combaluzier elevators are served by Wheelock machines and Girard pumps built by MM. of Quillacq, of Anzin. The Edoux elevator is powered by Worthington pumps. The generators that supply these machines are four in number and can supply 1,500 kg of high pressure steam per hour. They are tubular, Collet-Niclausse system. All this mechanical installation is arranged in the basement of the South stack (n ° 3). We will examine each of these bodies in detail. At the end of the nineteenth century elevator manufacturers were experienced technical engineers, they had to cope with particular constraints at each new installation. In addition they did not have a great experience and the technologies evolved terribly quickly. 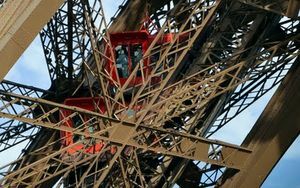 Installing elevators in the Eiffel Tower was an exciting challenge, a challenge faced by many companies with the ability to innovate to adapt to these constraints. These elevators were those provided on the plans, in the initial project presented to the jury. The latter rejected them, for some unknown reason. Eiffel decided to do without it and replaced them with the Roux-Combaluzier. Installed in the North and South pillars of the tower as soon as it was built, they were regularly replaced, renovated, and the brand is still the supplier of the tower for these pillars. So that's a long story for this brand. It is also she who equips the South pillar (private elevator and freight elevator). Two elevators of this system are installed one in the North pillar, the other in the South pillar. The project was established by the American Society of Elevators Otis, who built, in his New York workshops, almost all the parts of the mechanism. The Otis lift has the general arrangement of hydraulic funicular systems: that is, the cab is driven by a hoist connected to a hydraulic piston. The power is applied directly on the mitt and the resistance on the guarantor. 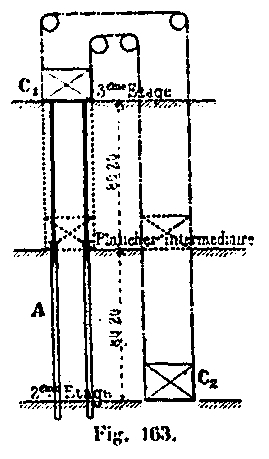 This device has the advantage of allowing the very considerable stroke of the cabin, ie 129.96 m, by a relatively small displacement of the piston, that is to say 10.83 m by employing a hoist with 12 strands; but, on the other hand, it requires a great effort, which, apart from the friction, is equal to twelve times the traction force on the cabin. This effort is obtained by water under a pressure of about 12 kg. At the lower part of the North and South pillars of the Tower, is a long cylinder inclined 0.965 m in diameter and about 13 m in length, in which moves the piston; above it acts the water stored in a tank located on the second platform. 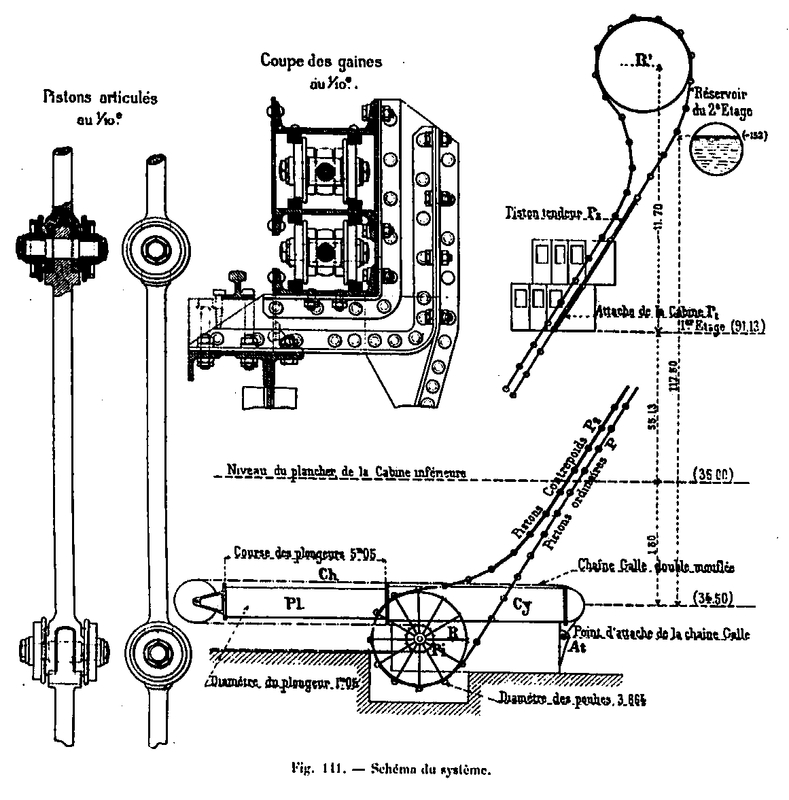 Two rods connect the piston to a movable carriage, carrying 6 grooved pulleys with a diameter of 1.52 m.
The cylinder and the track of the trolley rest on two beams inclined 61 ° 20 on the horizontal and having a length of 40 m. At the upper end of these beams are installed 6 fixed pulleys, in correspondence with the pulleys of the carriage to form a large 12-section mop hoist. The frame is fixed on the top of the beams and the end of the guarantor drives the cabin. To reduce the tensile force, a portion of the dead weight is balanced by a counterweight moving on a special race, and the cab is left with only the excess needed to can go down alone empty, driving the carriage of the movable pulleys and the piston; because, as we said above, the water pressure is never introduced by the top of the cylinder, which works for simple effect. These first indications are sufficient to explain the general operation of the elevator. When pressurized water is introduced above the piston, the cart pulls the cart from top to bottom, the guarantor passes over a system of return pulleys placed on the second stage and the cab is driven in the opposite direction (see Fig. 125 ). To operate the descent, communication is established between the top and the bottom of the cylinder: the cabin then descends under the action of its weight by raising the hoist carriage and the piston. In these two movements the piston rods are still working on traction, that is to say under the best conditions, because of their great length. During shutdown, water does not circulate or enter the cylinder. They fitted the East and West pillars, but only worked until 1897, the shortest lifespan for an elevator on the Eiffel Tower. They were replaced by "Fives-Lille". Note that this brand has continued its career under the name of Schindler, a great brand known today. Two elevators of this system, represented in the boards XXIII and XXIII-bis, are installed in the pillars East and West of the Tower, to mount the travelers of the ground on the 1st floor . 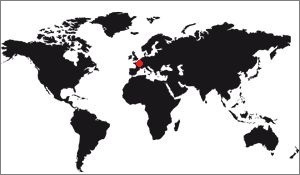 They were studied by Mr. Guyenet, engineer, according to the principle of the patent of MM. Roux, Combaluzier and Lepape. The main pieces were executed by MM. Carion and Delmotte, from Anzin. The system is based on the following principle: If a chain is made by means of rods hinged together and if it is forced to move in the interior of a rigid sheath, this chain will be able to work either on traction or compression, and it can operate in the manner of a single piston through which the movement of the cabin will occur. This one will remain, in all the points of its race, supported by a support likely to oppose its fall, as it happens in the hydraulic lifts of the system Edoux. In addition, this articulated piston can move in a curved path, which differentiates it from the previous system. The track on which the cab is moving is similar to that described for the Otis elevator. On each side of this path is installed the chain of pistons articulated in the form of endless chain, which meshes with the lower part with a drive wheel with impressions R and passes on a smooth return pulley R', placed above the 1st floor. The lower run of each of the two chains is attached to the cab, which is carried by rollers rolling on a line of rails placed on the rails of the raceway. Each circuit is enclosed in a continuous sheath that surrounds the drive wheel and the idler pulley. In the portion corresponding to the race of the cabin, the two parts of this sheath are juxtaposed (see XXIII Fig. 14). The cab attachment is made by means of a P1 iron beam, which forms part of the circuit. To give it passage during the course of the cabin, the lower sheath is open laterally. The current pistons P are formed of bars of 1 m in length, hinged together at their ends. 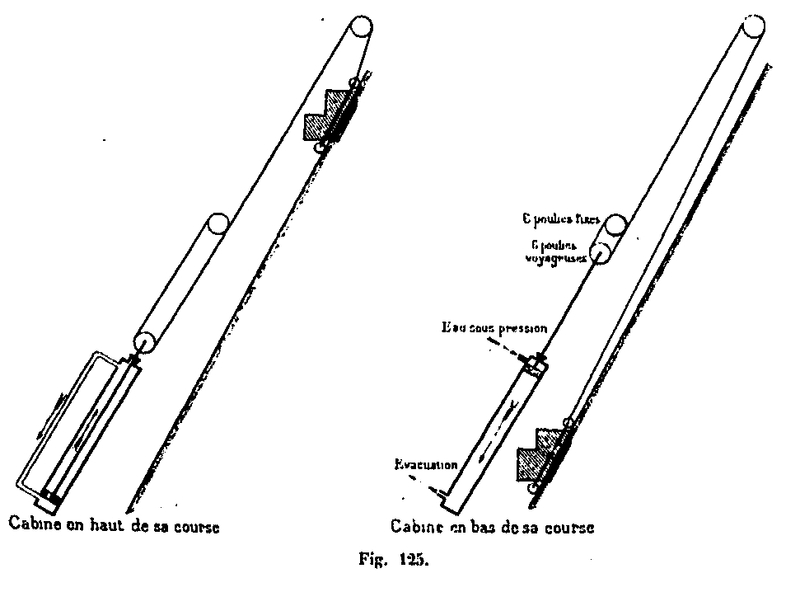 Each of these joints carries two rollers 140 mm in diameter, each moving between two rails fixed to the sheath, so that the rectangular sheath contains four rails placed near the corners, two at the bottom and two at the top ( see also figures 5, 6 and 14 of the XXIII). In each of these circuits are intercalated two P3 tensioning pistons, used to increase or decrease its tension, and pistons-counterweight Pt, intended to partially balance the weight of the cage (fig. 7, 8, 9 and 10, board XXIII). Each is powered by an absolutely independent hydraulic motor, which consists of a single-acting hydraulic cylinder Cy in which a plunger P / is driven, carrying at its end two pulleys, on each of which passes a chain of Galle, Ch. These chains, fixed at one of their ends At, actuate, after passing on the pulleys of hauling, pinions Pi mounted on the shaft carrying the driving pulley of the chain of the articulated pistons. For the climb, the cylinders are made to communicate with pressurized water; the pistons, pushed forward, drag the chains of Galle which turn the motor shafts. For the descent, the cylinders are made to communicate with the evacuation; the weight of the cage which is not completely balanced makes, by means of the articulated pistons, to turn the driving wheels and to enter the divers in the cylinder (see diagrams, figs 1 and 2, plate XXIII). Note that theseRoux-Combaluzier-Lepape lifts were replaced 10 years later by the Fives-Lille described below. These lifts were set up in 1900 by the manufacturer, "Fives-Lille". They replaced the old Roux-Combaluzier-Lepape lifts which lacked speed and reliability. They were installed in the East and West pillars. The detailed description of these lifts Fives-Lille is available, but on a special page because it is quite long. Click here to read it. At the creation of the tower the elevator rising from the 2nd to the 3rd floor was of the brand "Edoux". these engineers had invented a machine unique in the world: A cabin rising with the help of a hydraulic cylinder 80m long! It was dismantled in 1983. The elevator to transport passengers from the Tower, from the second to the third platform, is a vertical hydraulic lift with a total travel of 160.40 m. It was studied and built by Mr. Edoux, builder in Paris. The principle of devices of this kind is known: A metal piston, having for height that of the distance to travel, moves in a vertical cylinder, and carries at its upper part the cabin intended to receive travelers; the system thus constituted is balanced by counterweights suitably arranged and calculated. This type of lift, because of the exceptional race to be provided, could not be applied as it was to the Tower, and the apparatus to be constructed had to be so constituted that none of its organs could penetrate below the level. lower belts of the second floor. For this purpose, the race was divided into two equal parts by establishing an intermediate floor at mid-height. The running portion between this intermediate floor and the third platform (80.20 m) is crossed by making, as usual, support the cabin by the head of the hydraulic pistons, the two cylinders A are housed between the second floor and the intermediate floor. But, moreover, when one of the cabins C, rises from the intermediate platform to the third floor, the other, C2 forming a counterweight, descends from the intermediate platform on the second floor and vice versa. 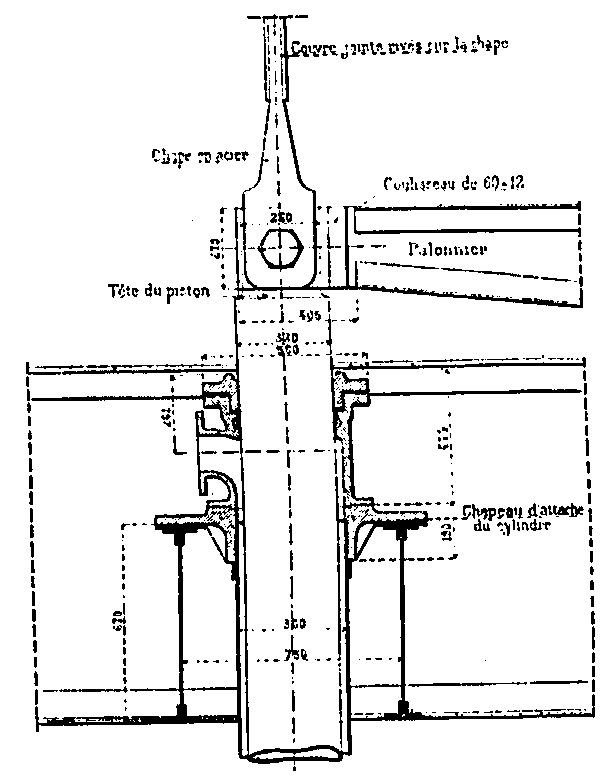 The project was first established with a central piston 0.45 m in diameter; but it was quickly recognized that the wind would have an unfortunate effect on this piston, by making an inadmissible arrow take the long rod abandoned over a length of 80 m. The arrow would have reached 2.00 m for winds of 100 kg. Also, it was led to split the piston, and replace it with two side pistons placed outside the perimeter occupied by the cabin, so it was possible to surround these pistons a sheath attached to the frame metallic and subtracting them from the action of the wind. These sheaths each provide a longitudinal slot allowing the piston head assembly to pass through the cabin. They are formed of hollow cast iron columns, nested one inside the other (see Fig. 164); they are bolted to the guide posts forming part of the frame of the Tower previously described; they rule the height between the intermediate floor and the third floor. Similar sheaths from the second stage to the intermediate platform serve as guidance for the counterweight cabin, protect the meeting cables of the two cabins, and serve at the same time for the parachute brake. 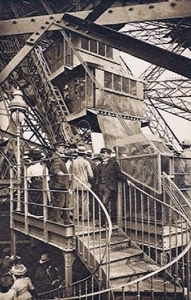 In the portion between the intermediate platform and the third floor where the return pulleys are installed, the cables joining the two cabins are guided in a light box made of sheet metal and angles fixed to the frame of the tower, which protects them also against the action of the wind. This is the most recent brand regarding the Eiffel Tower. A Schneider electric lift was installed in 1965 in the North Pillar.